Naturally wanting to distance themselves from the legacy of the Third Reich, some young filmmakers of German New Cinema looked towards the grandfather generation for a ‘legitimate’ German film heritage, with Bavarian wild man auteur Werner Herzog (Stroszek, Woyzeck) being one of the most vocal proponents of this notion as a man who was mentored by German Jewish film critic/historian Lotte Eisner (author of the imperative Teutonic film history works Murnau, Fritz Lang, and The Haunted Screen: Expressionism in the German Cinema and the Influence of Max Reinhardt) and would later play the ultimate celluloid tribute to his ancestors by remaking German expressionist master auteur F.W. Murnau’s masterpiece Nosferatu, eine Symphonie des Grauens (1922) as Nosferatu the Vampyre (1979). Indeed, even the ‘heart’ of German New Cinema, Rainer Werner Fassbinder, looked to his grandfather generation as a man who used German Jewish novelist Alfred Döblin’s novel Berlin Alexanderplatz (1929) as a template for many of his films, including his cinematically monolithic 14-part magnum opus Berlin Alexanderplatz (1980). Additionally, Fassbinder also produced and starred in Die Zärtlichkeit der Wölfe (1973) aka The Tenderness of Wolves directed by Ulli Lommel, which is a sort of quasi-remake/tribute to Fritz Lang’s expressionist masterwork M (1931) starring Peter Lorre. 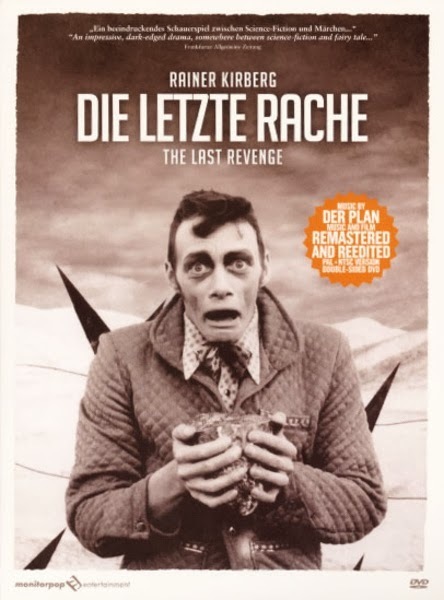 Undoubtedly, out of all the films of the German New Cinema era, the kraut classic Die letzte Rache (1982) aka The Last Revenge directed by Rainer Kirberg (Grottenolm, The Sleeping Girl) has to be the most literal take on Teutonic expressionism. An exceedingly eccentric and eerie yet darkly humorous work that seems like a celluloid crossbreed between Robert Wiene’s The Cabinet of Dr. Caligari (1920), Fritz Lang’s Dr. Mabuse the Gambler (1922) and Metropolis (1927), and Richard Elfman’s Forbidden Zone (1982), The Last Revenge certainly feels like the marvelously misbegotten celluloid creation of a raving mad movie scientist with an acute aversion to anything post-expressionist. 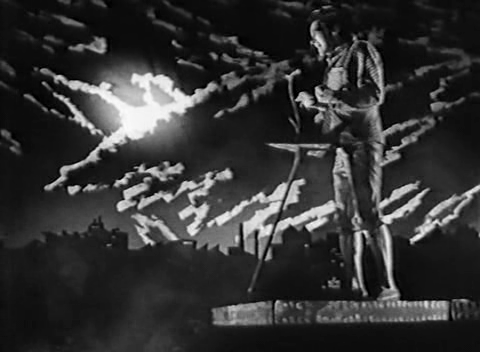 Made in collaboration with the Neue Deutsche Welle group Der Plan, whose third album “Die letzte Rache” was the soundtrack for the film and whose member Moritz Reichlt was partly responsible for the surrealist set design (not to mention member Frank Fenstermacher has a small role in the film), The Last Revenge was produced by the West German TV channel ZDF as part of their ‘Das Kleine Fernsehspiel’ series—a program responsible for producing important works by Fassbinder, Rosa von Praunheim, Edgar Reitz, and virtually any other important German filmmakers of the 1970s/1980s—and would develop a virtual instant cult following in Germany when it was first released and rightly so as a rare work that manages to pay apt tribute to the Fatherland’s expressionist legacy yet also manages to add to the aesthetic style that auteur filmmakers like Murnau, Lang, and Wiene pioneered. Starring the criminally underrated German actor Erwin Leder—a man who valiantly portrayed the schizophrenic serial killer in Austrian auteur Gerald Kargl’s criminally underrated masterpiece Angst (1983) and would go on to play eclectic roles in everything from portraying a Waffen SS officer in Spielberg’s Schindler’s List (1993) to playing a memorable role in the grotesque Hungarian arthouse flick Taxidermia (2006)—in the lead role, The Last Revenge is like The Cabinet of Dr. Caligari for those that cannot stomach silent film scores. 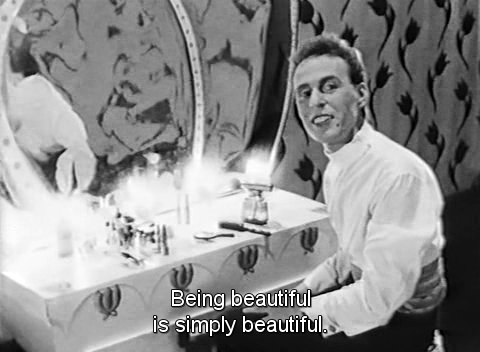 The Worldly (Erwin Leder) is a gaunt dandy-like dude who lives in a Teutonic desert where trios of singing fish heads pop out of the ground that somewhat resemble the sandworm from Tim Burton's Beetlejuice (1988) and deliver prophetic songs of truth and tragedy with a sort of sadistically sardonic flare. 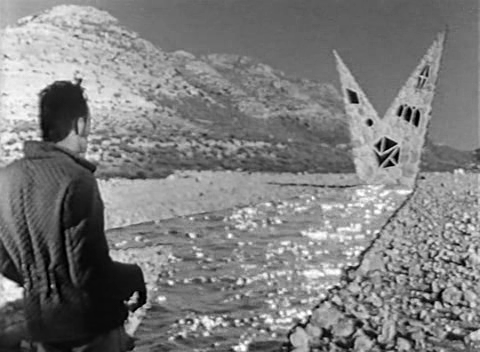 After traveling for some time on foot, Worldly reaches Water Hill, the home of the great Ruler (Gerhard Kittler, who died shortly after shooting the film), who invites the seemingly half-deranged dandy into his semi-aquatic home. The Ruler has just learned that his fiercely flamboyant Morrissey-esque son (Paul Adler) and quasi-dyke daughter (Anke Gieseke) are carrying on an incestuous affair, so he asks the Worldly—a man that catches the dictator’s attention by stating, “You interest me and I will interest you”—to do as follows: “I’ve lost my son. You’re the Worldly. Go out into this world and look for the man who will be my heir instead of my son.” To hide his undying shame, the Ruler decides to build a monument to cover up his perverse progeny’s decidedly degenerate legacy, stating, “I will put up a monument for you. Yes, the failure that you were in flesh and blood shall be clad in iron and stone.” Of course, the Worldly agrees to do the Ruler’s bidding and declares, “You shan’t be disappointed” to the somewhat melancholy monarch. Of course, as prophesied by a crooning trio of grotesque fish regarding the Worldly’s upcoming urban expedition, “ill fortune would strike, what terrible plight. Bad luck! Bad luck! He overrated his far-sight!” and indeed things do not go exactly as planned in eccentric expressionistic krautland. Of course, the Worldly finds his task to be rather dubious, but nonetheless finds three potential successors to the throne. The first is an obscenely narcissistic pansy fellow named ‘the Beautiful’ (Armin Sorg) who is, at the very least, ambiguously gay. The second potential heir is a swarthy philistine muscleman narcissist named ‘the Strong’ (Georg Ensermann) and the third is a neurotic and pedantic egghead named ‘the Wise’ (Richard Pleuger) who proudly proclaims, “Knowledge is my greatest virtue. Knowledge – always seeking for the truth. Reason asks the question “why?”, while the rest of the world goes by,” while ignoring the fact that his life is going down the drain as he spends all his time reading books. Of course, as can be expected from three exceedingly self-centered and power-hungry gentlemen, the contenders for the throne end up spending more time plotting each other’s demise than proving to be fit for rule, so the Worldly ultimately comes to the conclusion that he and only he can be the new ruler, declaring to himself, “I’m wandering this world, offering his inheritance: Fortune, wealth, and power. But what must I find: Nothing but stupidity, debility, and arrogance. He has no heir. No one is worthy. Nobody! Really nobody!,” as a true opportunistic man with a Svengali-like plan. Unbeknownst to the Worldly, a dubious Inspector (Josef Ostendorf) and his Assistant (played by Der Plan member Frank Fenstermacher) hired by the Ruler have been following him on his search and figures out his conspiratorial plan to take the throne. After giving a truly Goebbels-esque speech to the citizens of the post-industrial metropolis regarding his quest to find a new successor to the throne, the Worldly is given quite the shock when the Ruler takes the stage and gives a hysterical Hitler-esque speech denouncing him. Of course, the Worldly is imprisoned due to his treacherous plan and decides to seek revenge against the Ruler while getting all moody broody in his jail cell, declaring to himself, “The hour of retribution is near. Everything is a question of time.” And, indeed, the Worldly gets his revenge when a sinister and equally insane Rotwang-esque Scientist (Volker Niederfahrenhorst), who works for a huge industrial conglomerate called ‘Krebs’ (undoubtedly a reference to 400-year-old German dynasty Krupps that Visconti ‘damned’ in his 1969 masterpiece The Damned), breaks him out of prison and helps him seek his revenge against the Ruler. Rather unfortunately, in killing the Ruler, the Worldly and the Scientist unwittingly make him immortal, which was the Monarch's plan all along. In the end, the Worldly—a man who once proudly professed, “I am the dark unknown…the person nobody’s heard”—must come to the realization that he is nothing more than a pawn after the Ruler says to him, “Your friend achieved something great. I will pardon your rashness which, due to my maneuvering, has borne fruit. Let me assure you, you’ve achieved your goal: You’ve killed me! But I had anticipated your imprudence. Just as you disposed of those that may have hindered me, you have now eliminated the last obstacle in my way. You’ve created what you wished to destroy! You thought this would be the end, instead it is the beginning. Death has become life, time has become eternity. When death hath overcome them all, as they rot and stink repulsively, t’is I who’ll stand forever tall, never to perish, divinity! Farewell my friend. You have served your purpose. You have played your role! I shall now leave you to your fate.” Naturally, in the end, The Last Revenge manages to get weirder and weirder and more ludicrously labyrinthine, with the Ruler’s incestuous adult children torturing their father in his immortality, said Ruler’s children dying a tragic yet romantic death, and the Worldly taking on a deranged messianic-like mentality. As for as I am concerned, no other post-WWII film that I have seen has managed to better capture the aesthetic essence of works from the German expressionist than The Last Revenge. 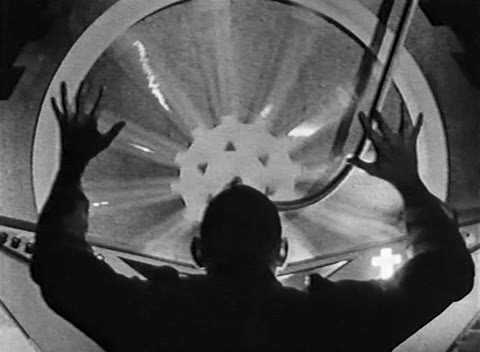 On top of that, there is no other film of its era that manages to be so detached from the prevailing aesthetic(s) of German New Cinema, as if auteur Rainer Kirberg had been given a time machine from the evil alien from the once-lost German science fiction Algol: Tragedy of Power (1920) directed by Hans Werckmeister in the hopes of destroying the Teutonic New Wave. While I am typically skeptical of films that attempt to mimic old films from the past and see it nothing more than a needlessly novel gimmick (with the obscenely overrated Academy Award-winning French flick The Artist (2011) being a great example of this), The Last Revenge manages to transcend mere postmodern dilettantism as a work that even manages to transcend Geheimnisse einer Seele (1926) aka Secrets of a Soul directed by G.W. Pabst in terms of it wonderfully wayward celluloid idiosyncrasy. 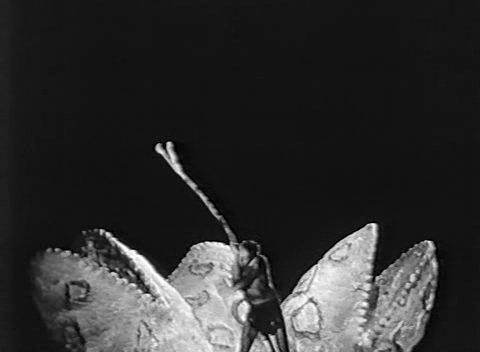 In terms of its featuring of Triumph of the Will-esque speeches from antihero the Worldly and his nemesis the Ruler, The Last Revenge also seems to mock, if not unintentionally so, the thesis put forward in kosher commie film critic Siegfried Kracauer’s reductionist-ridden Teutophobic polemic From Caligari to Hitler: A Psychological History of the German Film (1947). 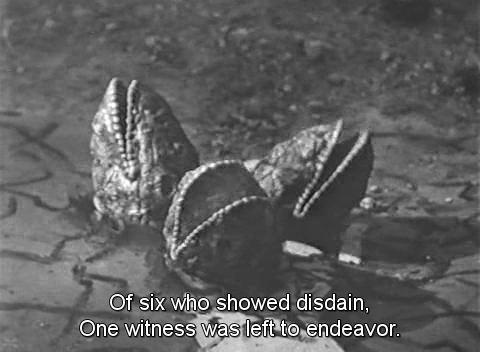 In fact, one of the things that makes The Last Revenge such a refreshing work, aside from its obvious audacious aesthetics and absurdist blend of storytelling, is its general lack of far-left political posturing and soulless social realism, as a work that would have certainly irked Kracauer, who vehemently bemoaned the so-called ‘escapist’ and aesthetic-driven essence of German expressionism. Indeed, avant-garde in a fashion on the polar opposite side of the spectrum to the aesthetically sterile works of a neo-bolshevik filmmaker like Jean-Marie Straub, The Last Revenge easily achieves what Canadian auteur Guy Maddin has merely attempted to during his entire filmmaker career as an innately provocative and strangely humorous neo-expressionist work that does not seem like it was directed by some autistic fanboy cinephile who has seen one-too-many Fritz Lang flicks.